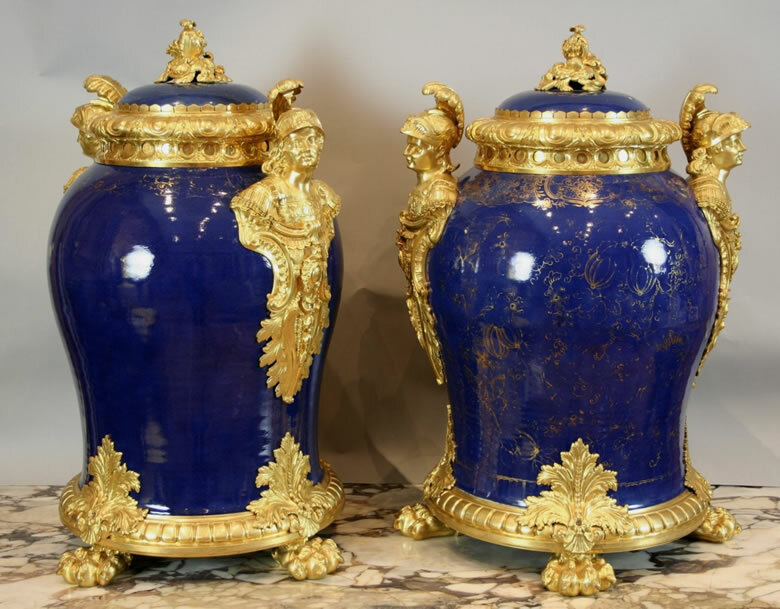 Pair of unusually large Chinese "Mazarin Blue" covered vases with magnificent ormolu mounts attributed to Charles Cressent. The Chinese covered vases are glazed in a rich purplish powder-blue glaze known as bleu mazarin, embellished with gilded decoration consisting of a diaper pattern border with floral motifs around the neck and melons and vines on the bodies. They are richly mounted in well cast and chased bronze doré. The cover has a top finial in the form of a large pomegranate surrounded by acanthus, scrolls, floral and scallop shell motifs and a simple ormoulu band held by flanges at the bottom. The neck of the vase has a large ormolu rim with a diaper pattern molding at the top consisting of alternating burnished cabochons and laurel motifs on a chased ground above a smaller band of reticulated circles in front of a plain separate back plate. Each shoulder mount is in the form of a large bust of a helmeted warrior, slightly turned outward, wearing a cuirass with an elaborate termination consisting of lambrequins, scrolls, acanthus and laurel motifs. The base has a band of rectangular cabochons raised on four lion paw feet, each below a shield composed of large acanthus leaves above a scallop shell. It is interesting to note that the ormolu circles beneath the rim are reticulated and there is a space between them and the ormolu band separately mounted behind them, which would allow the vases to look like and function as pots pourris.